Former Chief Executive of Asia Pacific Real Estate Association and Non-Executive Director of Emerge Capital Peter Mitchell said the trend of further foreign investment in Australian commercial property was likely to increase. "I think this is happening because since the GFC investors have become more risk averse so they are favouring more mature markets and for Asia-based investors that means Australia," Mr Mitchell said. "There has definitely been a notable shift in risk aversion and Australia rates very highly." He said while there was clearly a lot of money coming in from Chinese groups such as the China Investment Corporation (which bought a $2.45 billion collection of office towers from Investa two years ago), there would also be a new surge of investment from other Asian countries such as Japan and Korea. "We will soon see a greater spread from Asia and south-east Asia." WITH ¥500 trillion (approximately US$4.4 trillion), Japanese investors are a significant source of capital for investment into Australian real estate, according to AMP Capital. Investors from Japan are primed to play a key funding role and the Japanese institutional investment environment is undergoing a transformation. AMP Capital’s report, Generational Shift Sees Japanese Investors Flock to Real Assets, found Japan’s demographic profile as an ageing society combined with their desire for yield to fund retirement means direct real estate represents a compelling proposition for many Japanese investors. When compared to Japan’s Government Bonds, local and international real estate is attractive on a relative income yield basis. The opportunity for Japanese pension funds to allocate 5% to alternatives potentially means approximately US$230 billion worth of capital could be directed to direct real estate over the long term. "Advisory group, Emerge Capital Partners has been advising many interested investors in this space in Australia and says Australia's first build-to-rent, in the current cycle, is likely to emerge in the next 12 to 24 months. Emerge says the government does not need to intervene to make the sector work, although tax concessions and faster planning systems will allow the sector to take off faster, the same as any housing industry." Shanghai-based Ping An Real Estate Co and Tokyo-based Mitsubishi Estate Asia have been secured by Lendlease Corp as development partners for its A$1.5 billion Circular Quay Tower project in Sydney. Emerge Capital Partners has been involved in plans for this project since 2014. 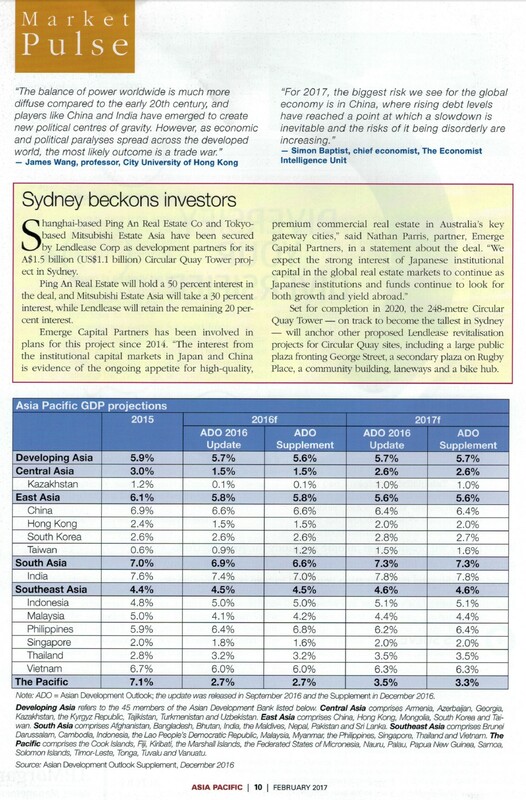 "The interest from the institutional capital markets in Japan and China is evidence of the ongoing appetite for high-quality, premium commercial real estate in Australia's key gateway cities." said Nathan Parris, partner, Emerge Capital Partners, in a statement about the deal. Emerge Capital Partners have been centrally involved in managing the capital partner process and seeing the joint venture negotiations through to financial close. On 22nd December 2016, the major Australian property group Lendlease announced that construction of Sydney's tallest office building will be funded by Chinese financial conglomerate Ping An Real Estate and Japan's biggest property company, Mitsubishi Estate, after Lendlease secured their backing for the $1.5 billion Circular Quay Tower project.